Jalandhar: Following the vision of International Pharmaceutical Federation (FIP) & World Health Organization (WHO), the School of Pharmaceutical Sciences at Lovely Professional University organized World Pharmacists Day-2017 at its campus, today. The global theme celebrated this year is “From Research to Healthcare: Your Pharmacist is at your Service”. 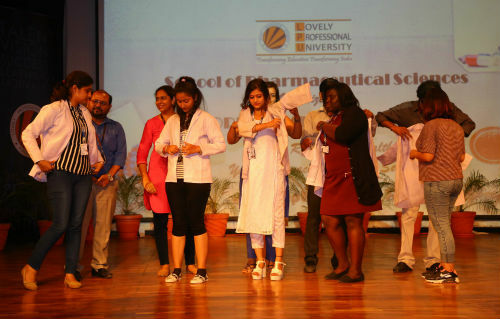 Near 700 LPU pharmacy students and staff-members gathered on a common platform and organized the event by scheduling many interesting and instructive programmes. In fact, FIP encourages pharmacists worldwide to participate in such celebrations every year on 25th September, the day FIP was founded in the year 1912. LPU celebrations promoted value in the pharmacy profession and caring for patients’ emerging needs. Emerging LPU Pharmacists vowed to follow the ethics as laid by Pharmacy Council of India and to be an integral part of healthcare system. During a symbolic ceremony, senior students welcomed new students by making them wear white-coats, which are symbol of nobility in the pharmacy profession. On this eve, competitions of art & craft for decorative items from waste material, short play, Rangoli-designs, slogan writing, poster-making and display of the departmental achievements were attractive programmes. LPU Director General Er HR Singla, Senior Dean Dr Monica Gulati and eminent guests from the field of Synthetic Chemistry Dr Anil Kannojia congratulated the pharmacy students & staff members for devising out day-long splendid programmes. Er Singla advised students to be true to their profession along with being humane in understanding. Dr Gulati expressed that millions of experts in medicines should promote pharmacists’ profession, as this profession is facing new challenges and changes. Dr Kannojia laid stress that pharmaceutical science and industry are to be focused on new, precise therapies, individualized approaches and innovation using latest technology and engineering. Illustrative, smart pharmacy in community and hospital settings offers patient centered services, while promoting responsible use of medicines, patient safety and quality of life. Patients like seeking professional help and advice presently; they include pharmacists in their decisions and expecting much more than just medicines. As such, the soul of pharmacy has to be nurtured and preserved through such celebrations and observations.